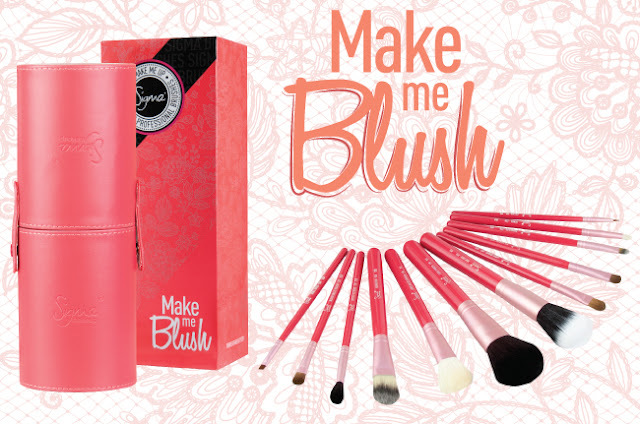 This month we are giving away one Sigma Beauty Make Me Blush Essential Kit! This professional 12-piece brush kit includes all the brushes you need for daily makeup application. From foundation to powder to eyes, it’s a must-have kit for your beauty arsenal to achieve the perfect makeup application! (We weren't kidding when we named this kit "essential")! Added bonus - the container turns into two brush cup holders for stylish and easy organization! The winner will be announced on the blog next week! Good luck! Oh great giveaway. I hope to have some luck. Thank you! beautiful giveaway!!! i love sigma blushes!!!!!!!!!!!! Gotta have it Want it Need it!!!!!!! Would love to win just starting out in the world of great makeup! Great giveaway, have you received my data correctly? Entered hope i have luck this time! My fingers and toes are crossed! I've been dying to own a set of Sigma brushes since I first learned of their existence. Owning a set in pink... it doesn't really get better than that. Thanks for the opportunity to win! Thank you for givingaway!! =} This kit is so cute. My opinion is that the blog is perfect and it does no improvings are requiered. Thanks for this oportunity to win this beautiful Sigma Beauty Make Me Blush Essential Kit. This is an amazing give-away what a great prize. Already a follower via GFC. Excited!!! Entered!!! Good luck everyone!!! Covering Dark Spots! Thanks for the opportunity!!! I would love to see tip and tricks on covering and concealing blemishes. Estou confiante e participando... Quem sabe ganho um kit desses em meu aniversário próximo, né?! Tenho objetivo de começar a dar dicas de maquiagem em meu Blog na prática. Este kit cairia em ótimo momento!! Cada vez que leio, procuro saber mais e cada vez admiro ainda mais a Sigma! I like Sigma brushes !! Hope I win! Great brushes, i would love to try them. Awesome! Just entered! Thank you Sigma! Going to share it with my friends! Good luck everyone! i hope i win... thanx for the oportunity..
That's an excellent giveaway! Thank you and good luck to everyone! I am a follower of this blog with the name "Νεραϊδούλα" (means little fairy in Greek). Also I submited the form with the name "Mary S." I honestly adore Signa company! Loved it! I really want to win! Congratulations Sigma cultural contest! You are the show! I like this giveaway! Thank you! Great give away! Good luck everyone! Wish me luck for my future greatest beauty. Entered the giveaway, beauty concern would be under eye circles/darkness. My biggest skin concern is oily skin and it always break out every once in awhile. Thanks for this great giveaway Sigma!! :) I have really come to LOVE your brushes through watching videos on YouTube of MakeupByTiffanyD...she's great! Great giveaway thank you for having one here and on the Facebook page! I want these brushes too much!!!! i love sigma and hope to win the kit. I've never participate to a giveway. I hope this will be my time! Thanks sigma.. I loved seeing the sigma site, most of variadade palettas .. I'll be waiting for the result .. I hope you get lucky! I just order at sigma brushes.. I love them more than my mac brushes. :) i would like to win here. Thx sigma for this awesome giveaway love your brushes!!!!!! Good luck everyone!!!! I am now a follower and just entered for the giveaway! Thanks! I hope i win! I've never won anything :( And this brush set is sooo adorable! Thank you Sigma! I would love to have this kit all the vloggers love it. Brilliant/awsome/fantastic giveaway, thank you so much, i really want to finally try out some Sigma Brushes, ive heard how great they are but i want to be able to say it myself :) Good Luck everyone!! A video on how to cover acne and acne marks with the precision sigmax kit!!! Gostaria muito de ver uma abordagem sobre manchas na pele, soluções para camuflá-las!!!! I have imperfect skin and chubby cheeks. I would love to learn proper concealing and contouring techniques. I heard a lot of great reviews from Youtube gurus and I would like to try my luck too. I produce my own videos too. Thank you Sigma and Good luck to all the Beauties. Lovely giveaway <3 love to have sigma brushes !!!!! I hope to win...Enter me,please! I don't know how to follow by google friend connect??? I'd like to see something about concealers :) to cover imperfections and dark circles! Just entered! I'm dying to win!!! Thank u Igma for the chance! !